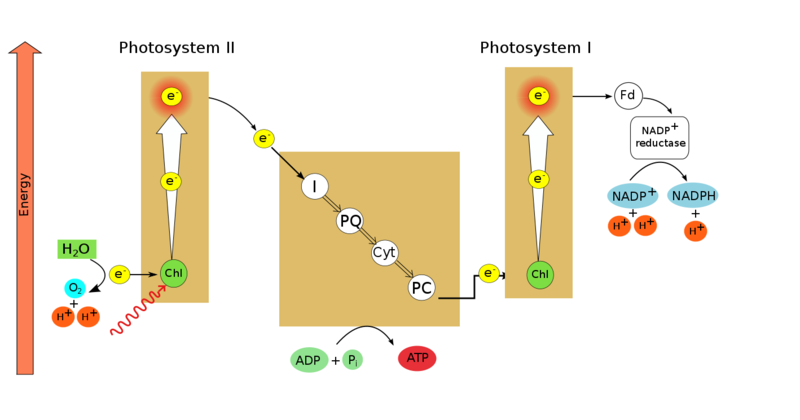 In steps (1) and (3), called Photosystem II (PII) and Photosystem I (PI),[ref]For historical reasons, photosynthesis II comes before photosynthesis I. [/ref] energy from light excites an electron in chlorophyll to a higher energy level. 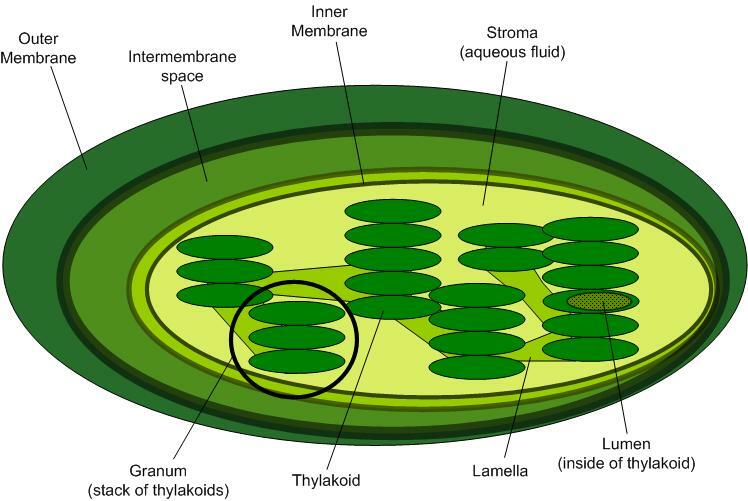 Since the most important form of chlorophyll, chlorophyll a, absorbs red and blue light but reflects green, leaves are most often green. Other pigments may absorb light of other frequencies and so give different colors. These other pigments (called the antenna complex) transfer any energy they absorb to the chlorophyll a in what is called the reaction center, which can thus collect energy from light of different wavelengths, extending the sensitivity range of the process. Only in the reaction center are excited electrons passed to the next phase. In stage 1, carbon fixation, the enzyme whose “much-needed nickname” is RuBisCO[ref]Kratz (2009), 197. [/ref], catalyzes the reaction of CO2 and 5-carbon RuBP into a 6-carbon compound which immediately splits into two 3-carbon compounds called 3-PGA. Then, in the reduction step, ATP and NADPH from the light reaction photosystem I reduce 3-PGA to G3P. On each tour of the cycle, one G3P separates from the cycle and these molecules eventually (at the end of six tours of the cycle) form a carbohydrate molecule, usually glucose (C6H12O6). 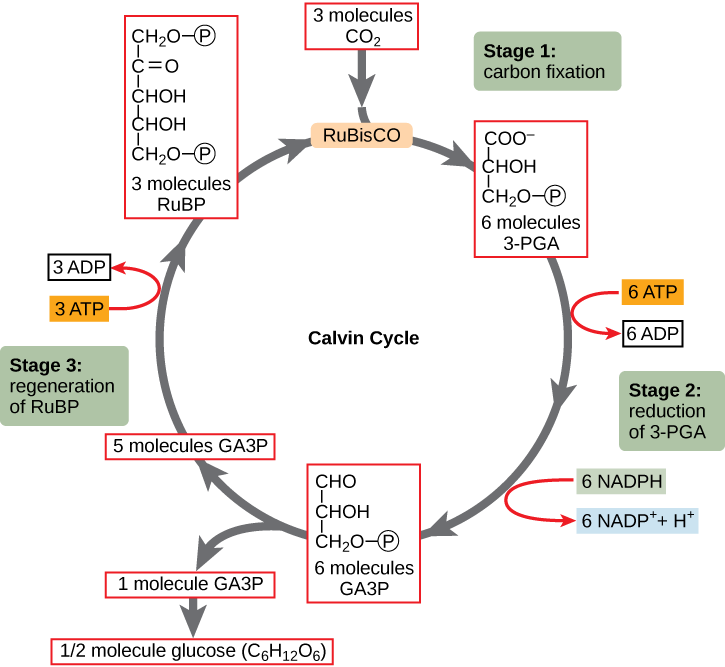 The other G3P molecule and ATP regenerate RuBP, so the cycle can begin again. 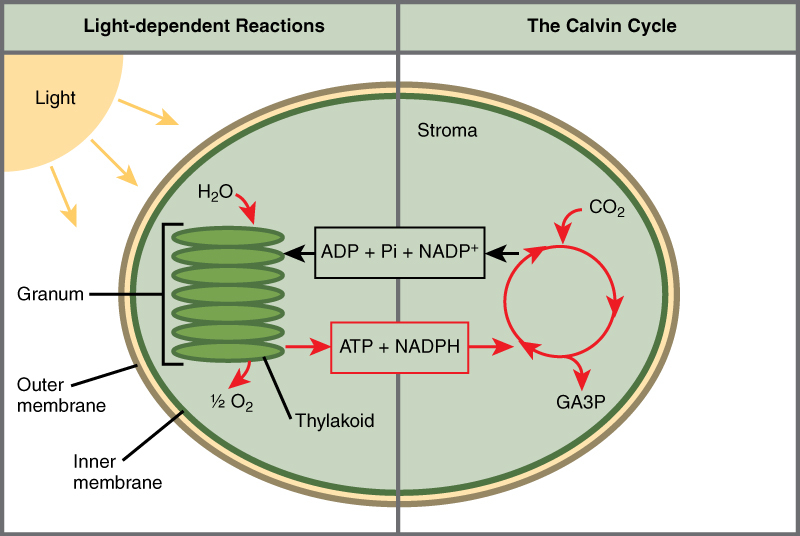 So it takes six tours of the Calvin cycle to convert CO2 into glucose. The complete formula is therefore the following.